24 ⅛ x 20 in. 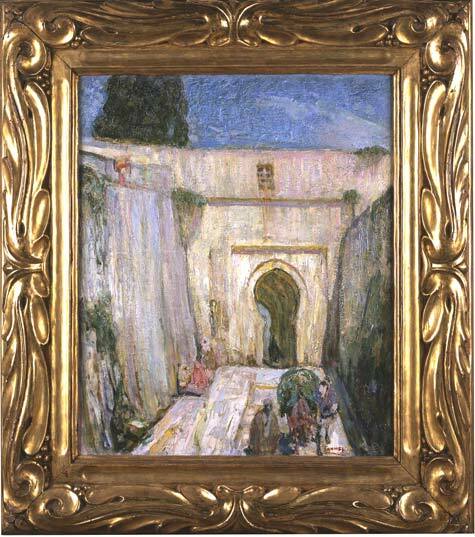 Henry Ossawa Tanner decided to become an artist at the age of 13. His father, a minister in the African Methodist Episcopalian Church, had hoped Tanner would follow in his footsteps, but to no avail. At the age of 21, he enrolled in the Pennsylvania Academy of Fine Arts where his mentor, Thomas Eakins, encouraged him to study landscape painting. Ultimately, Tanner would settle in Europe but would become recognized as one of the greatest African-American artists painting at the turn of the last century. In 1912, Tanner had the opportunity to spend three months in Tangier. The resulting body of work focuses on street life at the Casbah, and this work in particular probably depicts the Casbah’s East Gate. Companion pieces from this series can be found in the collections of the Smithsonian American Art Museum, the Milwaukee Art Museum, and the Saint Louis Art Museum.